I had never heard of Cholent. My introduction occurred as I was walking down an aisle that ran from the back to the front of a grocery store. I should mention that this was not my local grocery store. As I was walking, I noticed a bag of mixed beans on the shelf that was labeled Cholent Mix. Since I was in the middle of 30 days of beans, I grabbed the bag and decided to do some research. 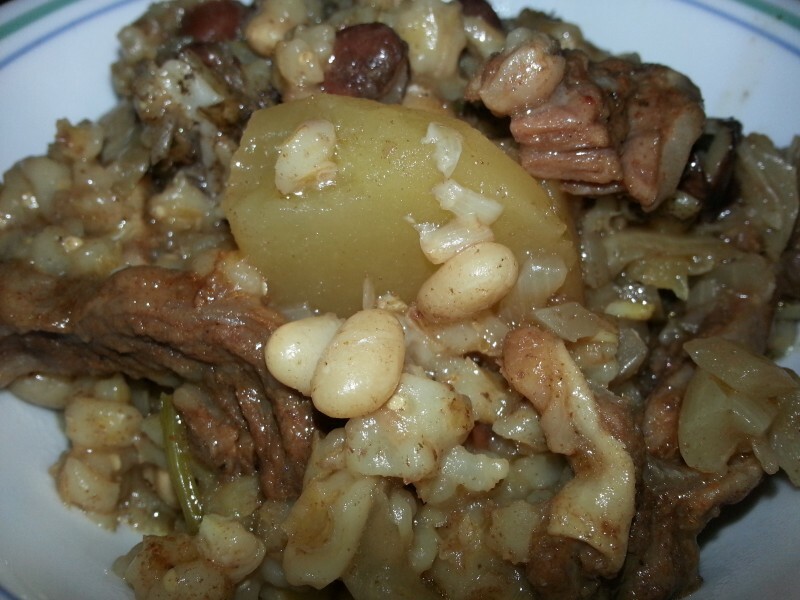 I learned that Cholent, which is sometimes spelled Chulent, is a Jewish sabbath dish that is started before the beginning of the sabbath and cooks in a slow cooker for eighteen to twenty-four hours before being served. The bag of Cholent beans didn’t have a recipe on it. The website for the company also lacked a recipe. During my research, I learned the reason for this. Cholent in Jerusalem is like Chili in Houston. Everyone has their own recipe and there are even Cholent cook offs to determine who has the best Cholent recipe. I watched YouTube videos. I visited websites and forums. I took copious notes. Finally, I felt prepared to begin with the recipe. Then, there was the challenge of the flanken. Most websites agreed that the correct meat to use was flanken, or beef short ribs. My local market did not have short ribs and had never heard of flanken. I finally found flanken at a mexican carniceria. I know the flanken from the carniceria wasn’t kosher, but I don’t keep a kosher kitchen, so it didn’t really matter. My local grocery store doesn’t even have a small section of kosher foods. When I inquired about a kosher section, I was met with blank stares. I had to explain about Jewish dietary laws. They still stared. At that moment, I had to admit to myself that I really do live in the middle of nowhere. When I mentioned Gefen brand, I got no response, but when I mentioned Manischewitz, there was some recognition. I was referred to the wine section. Trying to create an authentic Cholent experience, we assembled our ingredients in the crock pot before sundown on Friday and didn’t eat until the next evening. 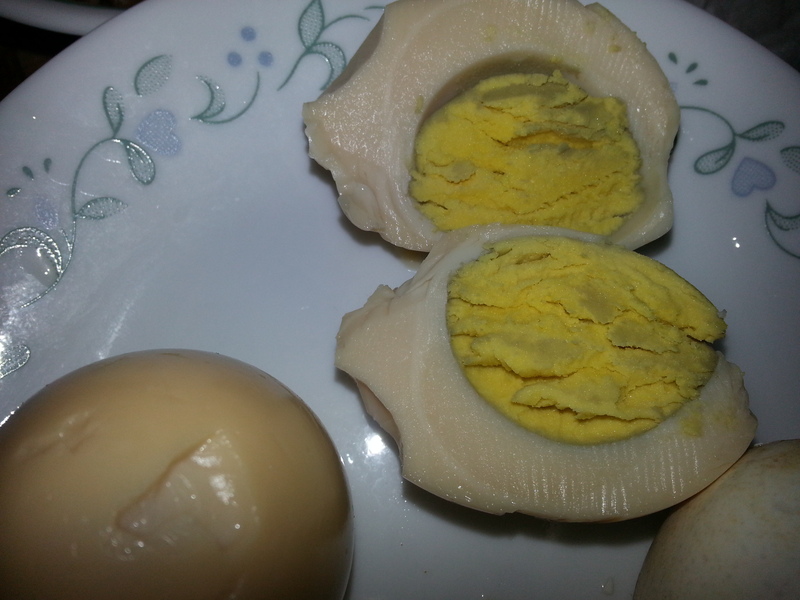 Unfortunately, I never found the kishka I was supposed to put into the dish. If kosher was an unknown, I shudder to think what would have happened if I asked about a kishka. Though the appearance of the finished dish was, in my opinion, unattractive when I removed the lid from the crockpot, the Cholent was very good. Once ladled into bowls, it looked much better. 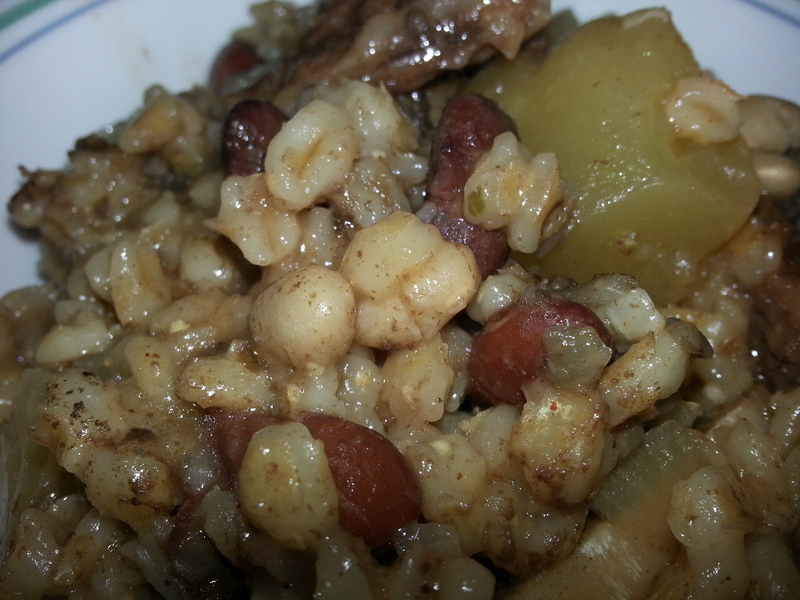 The cholent was a thick bean stew with potatoes, onions, barley, and meat. 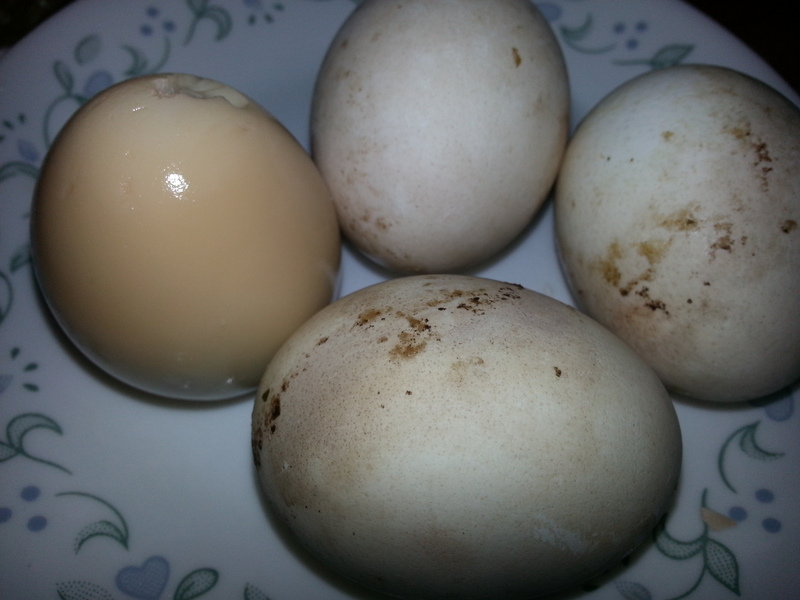 I threw a few raw eggs, still in their shell, into the pot, too. I had read that they were sometimes added. I also saw this done in a YouTube video that was in Hebrew, at least I think it was Hebrew. I have no idea what was being said, but I could watch what was being done as the man prepared the cholent. (The video has been removed, or I would link to it so you could watch the preparation methods, too. The finished eggs were tinted brown from the cooking liquid penetrating the shell, so they looked a little strange, but they tasted delicious. 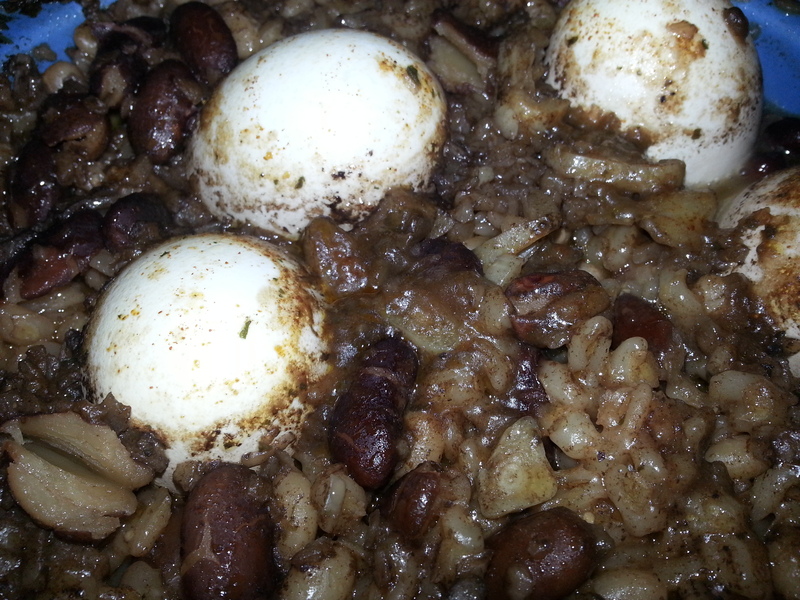 I have no previous experience with cholent from which I could judge, but we liked this. If you have experience with cholent, please let me know what you think by leaving a comment below. Cholent is the original slow cooker dish. Spray the container of the slow cooker with non-stick spray. Layer potatoes in the bottom of the slow cooker. Arrange onions on top of the potatoes. Carefully place flanken in a single layer on top of the onions. Pour beans and barley on top of flanken. Sprinkle bouillon, onion soup mix and paprika on top of beans and barley. Cook on low for 12- 18 hours or on high for 6 - 9 hours until beans are tender and barley cooked.